Estorager Makes Your Storage Easier! DURABLE MATERIAL - Made of 100% polyester mesh, sturdy and flexible steel frame, Longer service life; heavy-duty polyester mesh cloth allows great air breathability, keeping your clothes fresh. 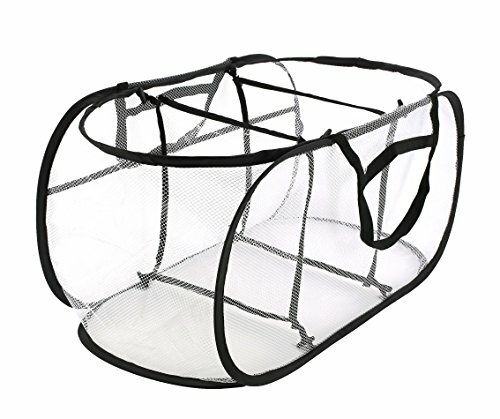 Offers 3 compartments to keep laundry organized, 2 removable mesh dividers can be detached to create large hamper. Spring wire Frame is easy to collapse for storage. Spring wire frame is easy to collapse for storage. When not in use, simply twist the hamper by your hands and fold the whole unit flat. -Item Size: (L25'' x W15'' x H12.6'') inches when open. LARGER ROOM - Expanded size: (L25'' x W15'' x H12.6''; Dia 9''xH2'' when closed.holds more than you can imagine; folded size: 9.1 Dia X 3 inches, lightweight and easy to store, without taking up too much space. DURABLE MATERIAL - Made of 100% polyester mesh, sturdy and flexible steel frame, Longer service life; heavy-duty polyester mesh cloth allows great air breathability, keeping your clothes fresh. The bottom of baskets is made of elastic terylene fabric, keeping your clothes from the dirt on the floor. STRUCTURE - Offers 3 compartments to keep laundry organized, 2 removable mesh dividers can be detached to create large hamper. Spring wire Frame is easy to collapse for storage. REINFORCED HANDLES - Handles on BOTH sides making hamper easy to carry. Each handle is reinforced and attached to the hamper with extra-strength stitching, in order to give the hamper greater loading capacity. Package includes: 1 hamper, 2 mesh dividers and 1 plastic packing bag. If you have any questions about this product by Estorager, contact us by completing and submitting the form below. If you are looking for a specif part number, please include it with your message.